If you are interested in learning Romanian, then I have compiled 35 easy steps that will get you on your way to a brand new language….after a few years. 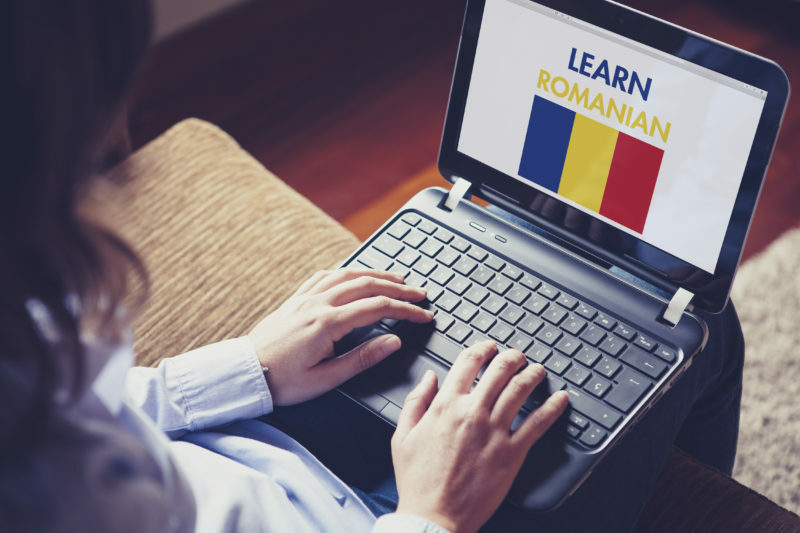 Enjoy learning and don’t forget to have fun with these great ways to learn Romanian. 1. Know that Romanian is NOT a romance language. If you know French or Spanish, that’s great! But, you can’t translate that to Romanian. It won’t help if you try. 2. Try learning a few words before you even visit. Even if you only know one or two words, it could be a big help, so see if you can meet and befriend Romanians here in the United States. 3. Actually travel to the country. You’ll learn very quickly that thousands of people in Romania speak English so this won’t help much, but you’ll have a better chance of picking up Romanian if you are in Romania. 4. In the United States, consider checking out a bookstore. If you find a Romanian-English dictionary, do a dance of celebration. They are impossible to find and if you pick one up, you found a rare diamond. Alternatively, if you really, really want a dictionary, then go online. You might find one that was printed in the 40s. 5. Here’s a good little exercise. Print out something in Romanian every day, like from a newspaper or magazine, and work on translating it. 6. Be careful using older Romanian/English dictionary. They changed the language and half the modern words won’t even be in there. 7. When you visit the country: enjoy being able to communicate because they all speak English, but you may have to go out of your way to get them to teach you the language. 8. See if you can find an online course to help you learn. 9. Don’t look for learn Romanian on tape courses because all you’ll learn is how to say hello. 10. Watch out when you are trying to learn and say numbers. The official way is very different from the conversational way. You’ll find out quick enough if you try to pay for something in Romania. 11. Here’s a number example. 14, officially, is pai-spre-zece. No one says that. They say pai-shpay. 12. Don’t underestimate the power of talking to people on the streets of Romania. They can be very helpful in learning vocabulary. 13. Immerse yourself in public transit. You won’t know the words and no one will help you, but sometimes you just have to jump in and swim. 14. If you move to Romania: keep in mind that you may be working with people who don’t speak English well. You might find yourself conversing in a combination of English and Romanian to get the point across. 15. Learn the different ways to say good morning, good day and good afternoon. People expect you to know and will get offended if you don’t use the right phrases. 16. Learn how to pronounce street names. Whether or you are visiting or living in Romania, You’ll need to know how to tell the taxi driver where to go. 17. When you meet new Romanians: ask them to speak to you in their native language. They may default to English, but you can’t learn the language that way. 18. Watch Romanian TV when you can. Just immersing yourself in the shows can go a long way. Just be prepared. Many Romanian channels in the country show exclusively English speaking programming. 19. There are two Romanian sitcoms that can help you a great deal. They are available on the antenna channel, so if you are in Romania, you don’t have to pay for cable. They are Trasniti in Nato and La Bloc. 20. Force yourself to form sentences. It’s going to be hard, but you can’t learn a language if don’t practice it. The more you practice saying the words, the better you will get with them. 21. When you ride in a taxi in Romania: try actually striking up a conversation with the drivers. Even if you struggle with the sentences, this is a good way to pick up new phrases and practice without a big audience. 22. Try to befriend people who speak English and Romanian really well. They won’t just be able to communicate with you, but they can help you understand the language and translate words for you when you are confused. 23. As you learn the language: start befriending people who don’t speak English or don’t speak it very well. It’s really the only way to force yourself to speak Romanian instead of defaulting to your native language. 24. Try visiting a place called Maramures. It’s illegal to speak English here. In other words, you won’t have any other choice but to find ways to learn Romanian and speak it. 25. A great way to learn Romanian is to pick up children’s books or watch children’s cartoons in the language. They will use very basic vocabulary and sentence structures so it’s easier for you t o learn too. 26. Be careful with other Romanian literature because the language is usually very poetic and very hard to understand. 27. When you are in Romania or the area, travel, travel, travel. The more you learn about the culture, the more you understand the language too. And when you travel, you meet all sorts of unique and interesting people. 28. Learn about something called righteous scolding and learn how to do that in Romanian. Essentially, if a complete stranger does something the wrong way, the goal is to act as self righteous as possible and scold them for their errant behavior. 29. If Romanians speak English to you, speak Romanian back. Total immersion is a must. You’ll probably get told you don’t speak the language very well, but that’s ok.
30. As you get more and more confident in the language, speak it as much as you possibly can. As you find different people to talk to, you will start learning more than just “book Romanian”. You’ll learn the spoken language and slang too. 31. When you ask for directions anywhere Romania: be sure to only ask for them in Romanian and then find your way to the location without translating anything to English. 32. If you want to take things a step further, try picking up Russian. The two languages go hand in hand and Romanian grammar will make sense when you see it applied to Russian too. 33. As you become more deft with the language: try helping out other people who have trouble speaking Romanian. Teaching others is a fantastic way to learn. There are plenty of people in Romania that are Hungarian or foreign exchange students from all over the world. You will have plenty of opportunities to learn by teaching. 34. Try speaking Romanian in a neighboring country like Hungary. If you get good enough at the language to convince them you are a Romanian native, it’s a big accomplishment and you will want to learn more and more. 35. As you get better and better at Romanian: start telling your American friends about your accomplishment. They will either be uninterested or they will want to hear you speak it. If they want to hear it, you get to practice more. With these 35 tips, you will find it easy, fun, and sometimes a little frustrating and interesting to learn Romanian.